The City of London Corporation has approved an application from Foster + Partners for their development on 20 Bury Street including the adjacent land, in the City of London. 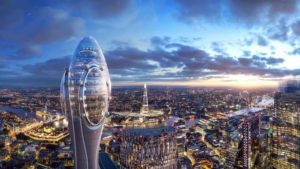 The building will have a total height of 305.3 metres making it the second tallest building in Western Europe after the Shard. It was decided yesterday (2 April 2019) at the City Corporation’s Planning and Transportation Committee following a vote of 18-7 to approve the project – dubbed ‘The Tulip’ – which is anticipated to welcome 1.2 million visitors per annum. The development will include a viewing platform with rotating pods, a restaurant and sky bar, cycle parking and shower facilities, a new pocket park at street level, publicly accessible rooftop terrace, and an entire floor dedicated to education facilities during school hours, which will also serve as a resource for local community groups and charities, into the late afternoon.